If you’re looking to grind some meat every now and then for your family and don’t want to spend too much on an electric grinder, you should just get yourself the best manual meat grinder to ensure the job is still fairly easy. As long as you don’t have to grind huge large quantities of meat at a time, a good hand crank grinder is affordable and will last many years. The best meat grinders for home use will easily grind between two and three pounds of meat per minute. Some manual meat grinders have semi-permanent clamps that screw down and affix to a countertop. The advantage of this type is that it is quite stable. Other manual grinders use suction cups. Unfortunately, it is easy for suction models to come loose when grinding and can disrupt and slow down the job. To ensure that this does not happen, the surface of the top has to be very smooth to create and powerful and airtight suction. The grip of the crank should be ergonomic, otherwise grinding can become uncomfortable fast. The rest of the parts are the same as that of an electric meat grinder, so make sure that the size of the plate is large enough for your needs and that the attachments that are necessary for all required jobs are either included or can be bought for the model. 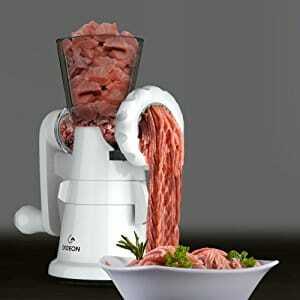 For a large range of top rated meat grinders to choose from take a look at Amazon’s stock. Otherwise, read on for our best meat grinder reviews. Top rated and the most expensive manual grinder on this list, if you won’t settle for anything but the best, then the LEM #10 Hand Grinder is the best home meat grinder you can buy. Although it is a solid stainless steel grinder, the blade is made of high carbon steel, which keeps a superior edge for cutting, while the plate is made of regular steel. That is contrary to what the description describes, so just be aware. When washed, these two parts must be hand dried immediately to prevent rust from forming on them, but the rest of the grinder can be allowed to air dry at your convenience. The very wide clamp opening will allow you to clamp it to nearly any counter top, and the plastic clamp guards will keep the mechanism from marring the surface it is clamped onto. It comes with three different sized sausage stuffing tubes and two different sized grinding plates for coarse or fine grinding. The crank turns easily and the design is made to grind up larger pieces of meat, which means less cutting when feeding the grinder. To that end, smaller pieces may get caught in the auger itself during the grinding process, but a couple of larger chunks to follow will force the smaller pieces through. Although poundage of meat being ground is limited to how fast and how long you want to turn the crank, this unit is heavy duty, and as long as you keep feeding the auger and cranking, it will continue grinding meat until your arm gets sore. The Gideon Meat Grinder is the most expensive of the plasticized grinders on this list, and it is also the most heavy duty of the bunch as well. No, it won’t hold up to heavy weight meat grinding, but this could be classified as a medium duty grinder that will do almost any meat grinding that a metal grinder could do. The unique twist suction attachment still requires a smooth surface, but it may be the most solid suction cup here. The plates and blade are made of metal, and the rest of it is dishwasher safe. You won’t get any more accessories like a sausage stuffer because it has been optimized for meat grinding only and you can still grind up meat for sausages. The handle, even made of plastic, is solid and sturdy, and it is the best plastic handle here. This unit will take on gristle and grind it up, and it will even grind through a bit more fat than the others too. That means tougher cuts of meat that might bog the other plastic grinders down will readily grind in the Gideon. For fatty cuts of meat, make sure you first firm up the meat in the freezer for a while before grinding. The Kitchen Basics 3-in-1 grinder can technically do it all, yet it is one of the lower priced grinders on the list. It is essentially all plastic except for the grinding blade and the plate, so it is all dishwasher safe but can generally be hand wiped clean. It comes with a variety of accessories such as 3 sausage stuffers and a plate adapter, 2 different sized metal plates and 2 plastic pasta plates. It uses a suction disc to hold it firmly to a countertop, but like all suction devices, the surface must be near glass-like smooth. Of course, because of the plastic construction, this is not a heavy-duty grinder and it will not perform as such either. Fatty meats and gristle will not grind successfully and may jam the unit. But it will give a good account of itself under most lighter duty grinding tasks. You can try fatty meat as well if you first firm it up in the freezer. The instructions are not particularly helpful, but they will show you the basics. That said, grinders are pretty simple devices, just put meat, pasta or what you’d like to grind into the hopper, turn the crank and grind away. The Bellemain meat grinder is the least versatile grinder on the list, with no accessories other than 2 different sized grinding plates. However, it may also be the best low priced plastic meat grinder here and that is exactly what it is optimized for, grinding meat. The dishwasher safe plastic housing and inners are easy to clean, with the only metal parts being the plates and the actual cutter. It comes with a meat pusher for feeding the hopper, and a suction disc that attaches to any smooth surface. But don’t expect to stuff sausage as there are no sausage stuffers included. It works best with 1 inch square cubes of meat, but keep as much of the fat out as possible to avoid jamming. If you prep the meat as stated, you will have a good and serviceable inexpensive plastic hand-crank grinder for lighter duty meat grinding chores. The Norpro meat grinder is the least expensive grinder here, but it may also be the most versatile unit, as long as you do not want a grinder that can do heavy-duty grinding chores. With the exterior made of plastic, and in fact the only metal parts are the cutting blade and blade plate, it is capable of nearly being damp-wiped clean. However, if need be, it can be hand washed and allowed to air dry. The suction attachment will hold the grinder in place solidly, but the surface must be smooth for it to hold properly. It comes with several pasta attachments, a sausage stuffer and two different sized grinding plates, so it can live up to its versatile nature, but there is more to this than meets the eye. The unit really is made for light duty work and if you press it to do more, the results will be unsatisfactory. For example, you can certainly grind meat, but make sure it is low fat or the fat will clog the auger. Also, no gristle, bones or tough chunks of meat either or you’ll be stressing the mechanism which may jam, or worse, break. It works best as a pasta maker, and if that is a priority, then you may be satisfied with this unit. However, too watery and the pasta will be like glue, and too thick and it may not feed correctly. Ultimately, what you pay for is what you get, and if you want to have a low cost grinder or pasta maker, and you won’t be doing any heavy-duty grinding, the Norpro may work well for your needs. This may seem obvious, but if you are grinding large amounts of meat, tough meat or meat with a lot of fat, the LEM is really the best hand crank meat grinder to have. It will work as long as you turn the crank, and be ready for the next batch when you are. If you are doing light to medium duty meat grinding, then the Gideon would be a solid choice. It will grind meat that the other plastic grinders can’t, and although a bit more expensive then the other plastic grinders, it’s a better choice for meat grinding if that is your priority. If meat grinding is not a priority and you want a functional grinder for a variety of foods, the Kitchen Basic 3-in-1 will give a good account of itself for a variety of grinding tasks. Just don’t expect it to grind meat like the LEM or the Gideon, and you’ll be doing fine.